I use it all day, every day at work. I also help run my office Fantasy Football league. See where this is headed? Our consultants work all over the US, so we can’t rely on in-office banter to build the trash-talking culture that is the foundation of all great fantasy leagues. 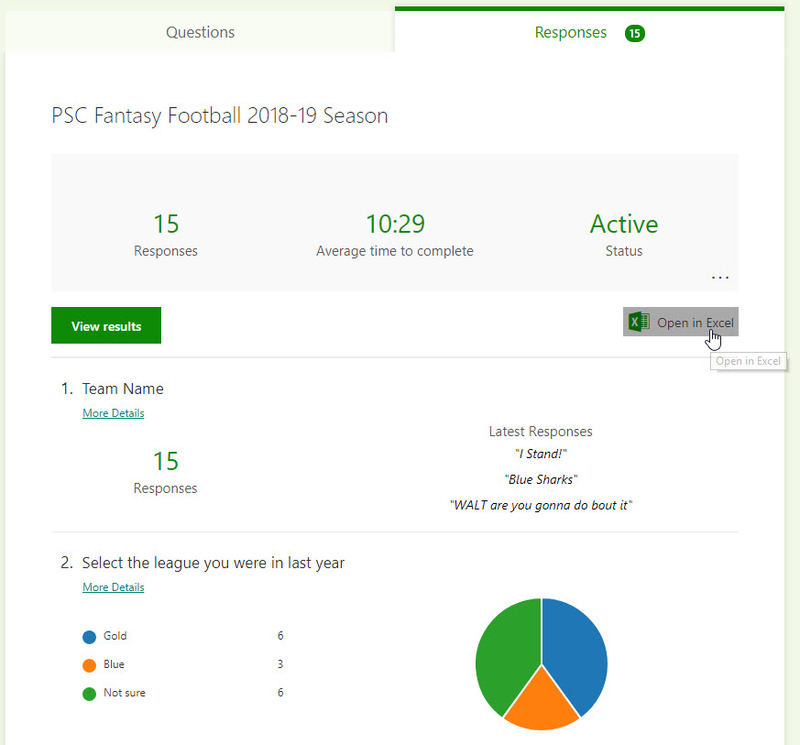 This year, I decided to run our league out of Teams, just to see if my favorite persistent chat app could provide the same value for non-work-related activities. The results have been surprisingly great so far. Below are a few things I set up in Teams to make our fantasy season a little more fun– read on to learn more about each one. We run two separate leagues, so a channel for each league made sense to confine trash talk, etc. to a single location. We have 20 players each year— too many for a single league— so we run two leagues, a Blue and Gold league. In addition to the General channel, we created a channel for each league to host game day threads and league-specific announcements/trash talk. More on that later. When we first started the PSC FFL, we sent a company-wide email asking every interested owner to email the commissioner with their team details. We eventually evolved to use a SharePoint list, but the user interface wasn’t great and we couldn’t collect responses how we wanted. 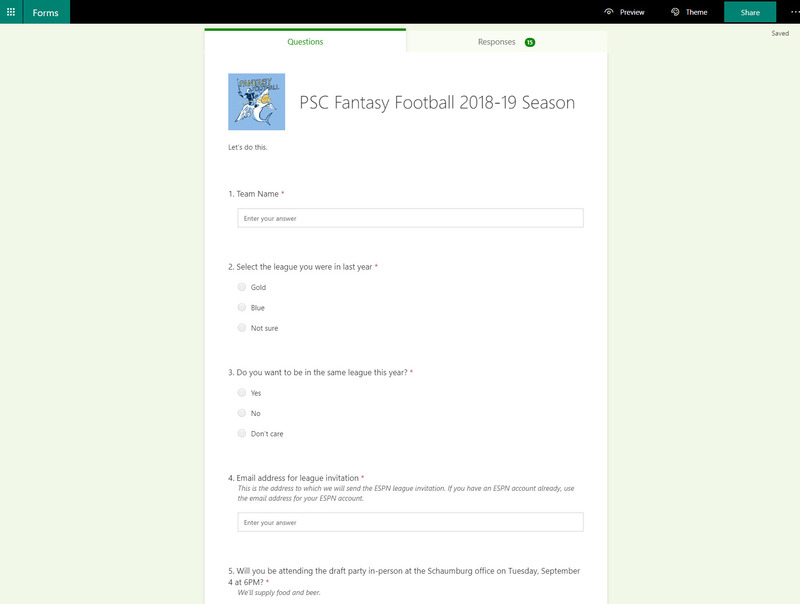 Enter Microsoft Forms: I just created a signup form in Forms, then posted the form to as a tab in our General channel so owners could sign up for the FFL season and let us know if they’re attending the draft party. And we still sent a link to the form to the whole company so new owners who weren’t part of the Team could still sign up. Creating the league sign-up form in Microsoft Forms was as easy as adding a tab in Teams. To make sure everyone knew where they were drafting, I @mentioned each team owner when I posted the draft order in our General tab. The result was a solid start to the annual trash talking. Probably the most fun I’ve had with SharePoint, ever. Each week, I write power rankings and post them as fodder for trash talk. Are they accurate? Nah. Scientific? Nah. Fun to write? Hell yes. And (I think) the rest of the league enjoys reading them. I write the Power Rankings using the new, modern SharePoint News feature that comes with the SharePoint site for our Team. Creating news is as simple as opening the SharePoint site for the Team and clicking the Add News button, which instantly opens a full-page editor to which I can add an unlimited number of web parts including images, rich text, links, etc. To access your Team’s SharePoint site, click the Files tab in any of your channels, then click Open in SharePoint. This will open the SharePoint site for your Team. On the SharePoint site, click the Home link in the left navigation. Then click Add news. Once on the News page, you are presented with a full canvas for adding rows, columns and web parts. I used the one third left layout and created a row for each Power Ranking. In the right column of each row, I added a text web part in which I wrote the ranking details. In the left column of each row, I added the Image web part. Protip: change the image type from “Creative Commons only” to “All” for better results, but be careful not to violate any copyrights. When I was done editing, I just clicked Post News and voila! It posted to our SharePoint site’s home page. Step 2: Choose the page you want to turn into a tab. Just for kicks, I also configured the SharePoint News connector for the team to automatically post in our General channel when news was added. That way, the next time I post power rankings, the news will automatically post in Teams. Now, when I post news to SharePoint, a message is automatically created in Teams and my team members can reply to it. If you’ve ever participated in a Game Day Thread (“GDT”) in a community like Reddit, you know how fun they can be. In search of a similar experience, I created a GDT for our FFL league to host all of our game day trash talking and it was a rousing success – 77 replies on the first Sunday of the season! I created a quick “Matchups” spreadsheet in Excel with a table featuring every matchup, each team’s record and the point spread. I copied the table directly into the Teams message, @entioned the league, added an inspiring GIF, and away we went! Boom, trash talk. This one took me outside the Microsoft ecosystem, but is a great example of how extensible Teams is and how easy it is to integrate it with other applications– in this case, IFTTT. First, I created an incoming webhook on my teams’ General channel– this is just a unique URL that can accept REST calls from any application. FYI, creating an incoming webhook creates a PUBLIC webhook URL. …but this time, I chose the Incoming Webhook connector by clicking Configure next to the connector details. After creating the webhook, I logged into my IFTTT account and clicked New Applet. If you’re not familiar with IFTTT, it’s a user-configurable workflow tool very much like Microsoft Flow that allows you to respond to events from one service (“if this…“) by taking actions in another service (“then that…”). I typed “ESPN” to filter the list of available triggers, then clicked it to select it. After clicking Create action, I renamed my applet and clicked Finish.